Hawthorn preparations are derived from the flowers, leaves, or berries of a thorny shrub (Crataegus oxyacantha) native to Europe. The Hawthorn plant is a source of bioflavonoids and other antioxidant chemical compounds. Hawthorn helps promote cardiovascular health. 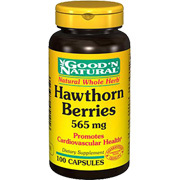 Hawthorn helps promote cardiovascular health. Hawthorn Preparations are derived from the flowers, leaves, or berries of thorny shrub (Crataegus oxyacantha) native to Europe. The Hawthorn plant is a source of bioflavonoids and other antioxidant chemical compounds. For adults, take one (1) capsule two to five times daily, preferably with meals. Capsules may be opened and prepared as a tea, or dispersed in any liquid desired. James "Good for Blood Pressure"
Took it for blood pressure control and it ended up working just as well as a prescription product. Well that it is after taking ti for 3 weeks to build up but it worked and I didn't need a prescription to get things done. priced very well and they helped with blood pressure for my husband who takes one daily. B.P. 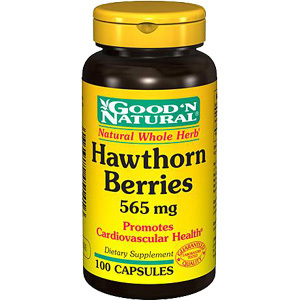 "Good For The Heart"
Hawthorn Berries 565mg is shipped in a discrete, unmarked package. Orders are processed immediately and usually take about 3 to 5 working days to be received. We do ask that you try it for 2 to 3 weeks to feel the full effects. Any information received is used only for order processing and shipping purposes. Your information, such as e-mail address, will never be disclosed to a third party.